Barnes agreed to a one-year, $1.6 million contract with Boston on Friday, avoiding arbitration, Alex Speier of The Boston Globe reports. Barnes made 62 appearances out of the bullpen a season ago, posting a 3.65 ERA and 1.26 WHIP with 96 punchouts over 61.2 frames. 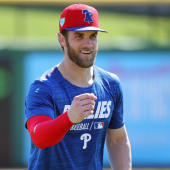 He figures to receive plenty of high-leverage opportunities in 2019 and could compete for the closer role if he carries his recent success into spring training.